After Dark is a FREE EVENT coming to the Lied Center at the University of Nebraska! This dynamic one-night event will feature a free concert by 1.1. Six hip hop artist Andy Mineo and Warner Brothers country artist as seen on “The Voice,” Corey Kent White, along with a captivating presentation by author & speaker Joe White. 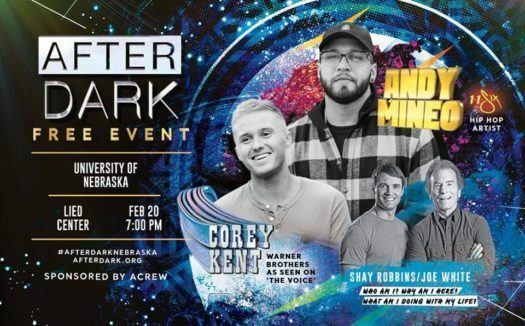 Since 2000, After Dark has been an unforgettable night in the lives of over half a million students on hundreds of college campuses across the nation and now it’s coming to Lincoln!